Supporting antifascists sends the message that white nationalists, neo-Nazis, and other white supremacists won’t be allowed to organize without facing opposition. By supporting Jason, you are not simply buying a t-shirt, you are placing yourself in a community of individuals committed to upending organized white supremacy. So even if there is not a shirt in your size, you can still make a donation and have the t-shirt as a reminder of Jason, the Tinley Park Five, and all the unnamed folks willing to risk their freedom to stand against fascism. Hang it on a wall, give it as a gift, cut it up and make it a patch, banner, or flag. 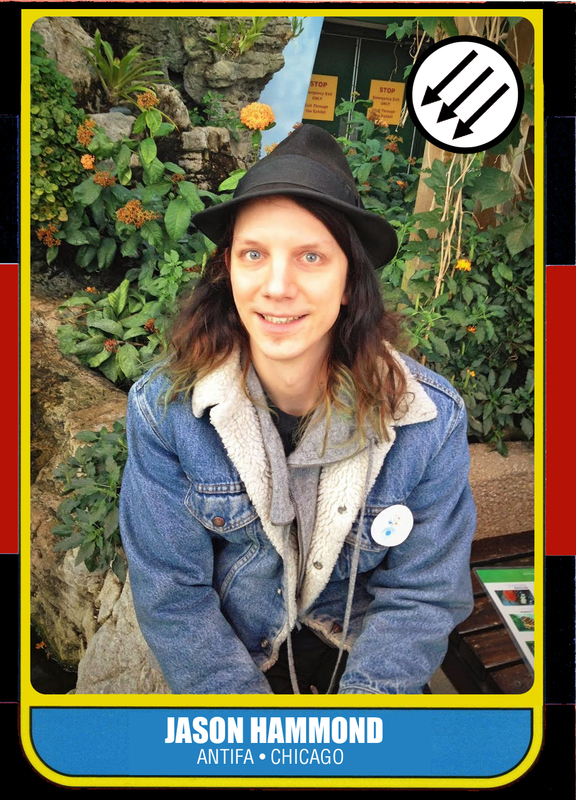 Jason Hammond pleaded guilty, while refusing to provide information on others, to state charges against him for participation in an organized direct action taken against a group of white supremacists in May 2012 in Tinley Park, Illinois. Jason is currently serving a sentence of nearly three and a half years in an Illinois state prison. We did it, NYC! We survived the storm of the century a regular winter snow storm. NYC ABC is not known for backing away from supporting our imprisoned comrades, regardless of weather or other reasons, and this week will be no different. We are focusing this week’s letter-writing dinner on recently imprisoned anti-fascist Jason Hammond. Illustrated Guide Version 9.6 Now Uploaded! We’ve finished the latest version of the NYC ABC “Illustrated Guide to Political Prisoners and Prisoners of War” and it’s available for viewing (and download) by clicking on the tab at the top of this page. This update includes address changes for a few prisoners as well as removing Dylan Sutherlin (TIME SERVED!). Unfortunately, this version also includes the addition of two new folks– Luke O’Donovan, a queer, anarchist radical self defense prisoner, and George Horton, a 2010 Toronto G20 protest prisoner who was out of prison pending an appeal that was denied.